Martinez and Company consultants and managers assist clients globally to meet ISPS-MTSA and C-TPAT compliance aboard their vessels, within their seaport facilities, and throughout their supply chains. Our senior consultants have also received certifications in port and vessel security training by the U.S. Customs Service and by the U.S. Federal Law Enforcement Training Center (FLETC). Our staff consultants have received certifications from the Maritime Institute of Technology and Graduate Studies (MITAGS) as Port Facility Security Officers, Company Security Officers, Vessel Security Officers, in addition to all levels of the ISPS and MTSA security programs. Consultants provide clients the technical knowledge for reference, recommendations and act as liaisons between clients and the U.S. Department of Homeland Security, state and local government, and other regulatory agencies. Martinez and Company provides practical approaches to security that are rational and effectively integrate into existing operations. If our clients receive any fines, penalties, or stoppages, Martinez and Company consultants can work with them side-by-side to mitigate resulting damages and keep the continuity of their business flowing. 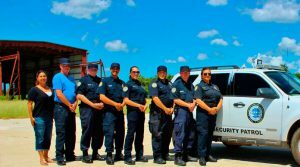 Martinez and Company can provide the right solutions to meet the clients safety and security needs at any location.